Wild violets have pretty, five-petaled purple, blue or white flowers that are an early sign of spring. They are also tough, invasive and fertile weeds that can easily take over your yard. Wild violets are generally found in moist, cool, shady areas, but they are persistent enough to spread into sunny or dry lawns. Controlling or eliminating wild violets is not easy. You can pull them by hand or dig them out, but it's difficult to remove all of the plants' rhizomes. 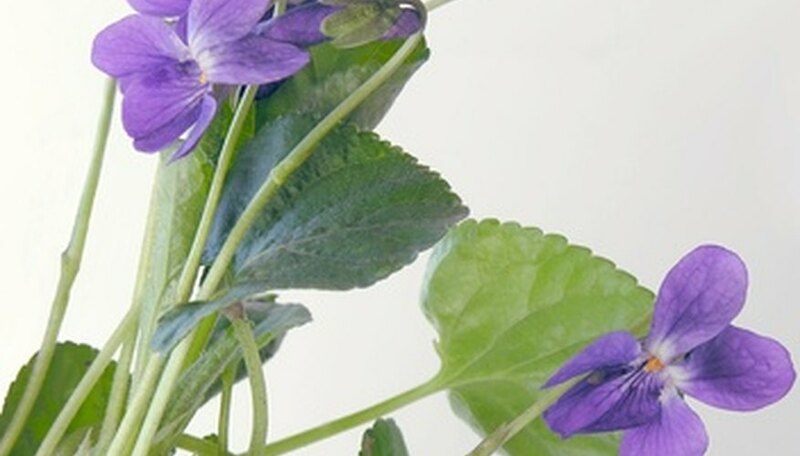 A faster method of controlling wild violets is to apply an herbicide. Glyphosate is a "broad-spectrum, non-selective systemic herbicide," according to the Extension Toxicology Network. It can be used on all annual and perennial plants, including grasses and broad-leaved weeds. Use glyphosate (sold under brand names like Roundup or Touchdown) on wild violets in smaller areas such as ornamental beds and areas without grass. Because it is a broad-spectrum herbicide, it will kill anything that it touches. Spray glyphosate only on the wild violets, and do not use it on a windy day, as the herbicide may come in contact with plants you do not wish to harm. If wild violets have invaded your lawn, use a postemergence broadleaf herbicide. These herbicides will kill the violets, but they will not harm your turf. UMass Extension recommends using a herbicides that combine phenoxy (2,4-D, 2,4-DP, MCPP, MCPA) and benzoic acid (dicamba), such as Sword or Dyclear. You may need to apply several applications over an extended period of time, and UMass warns that the applications most often result in only fair control. According to UMass Extension, the best way to control wild violets is to use triclopyr, either alone or combined with other broadleaf herbicides. Triclopyr is sold under brand names like Battleship, Confront, Chaser and Turflon Ester. Apply these herbicides between late April and mid-June, or in the beginning of September through mid-October. You may need more than one application, and fall application is usually more effective.